When I first started looking at photos of Blythe, the ones that really drew me in were the ones with the fantasy coloured hair. I totally thought I would end up with a rainbow family with red, orange, yellow, green, blue and somehow find a purple one. That’s what I had thought would be the case when I was dreaming about what my “dream” doll family would be. Oddly enough, it’s two years in and I have only two fantasy coloured dolls (Simply Peppermint and Cappuccino Chat – I consider the silver to be ‘fantasy’ because she’s not old). All my other doll are brunette and otherwise dark-dark nearly black/are black. What happened? What happened to that rainbow of pretty doll hair that I was convinced that I would have? Luckily the third doll that arrived in my doll family was Simply Peppermint (Tertiary Jane) – the three dolls that followed after her were all very dark browns/black haired dolls. Somehow my ‘ideal’ doll family changed, it went from rainbow to more natural colours. And completely without being intentional, the dolls started to have hair close to my hair shade rather than all the colours of the rainbow. This isn’t stopping me from getting dolls with more varying colours in hair. That’s why there’s a new ‘dream’ list, I really do need to make the doll family a little bit more well rounded (and to also include a few other mold types!). I don’t think I would give up any of the dolls that I currently have, but I would like to have more variation in terms of hair colour (which is why I’ve put a self-ban on any more brunettes or very dark browns/blacks from entering the family). In a way, not having all fantasy coloured haired dolls is a good thing – no one in my house really notices when a new one arrives because they all look the same. If I started having blue-haired dolls, someone might notice that there’s yet another blue-headed doll in the house. What kind of Blythes were you drawn to when you first discovered Blythe? What kind of Blythes do you have now? I had to laugh when I really looked at the first two dollies I bought and discovered that they were (unintentionally on my part) almost identical to my two real daughters! 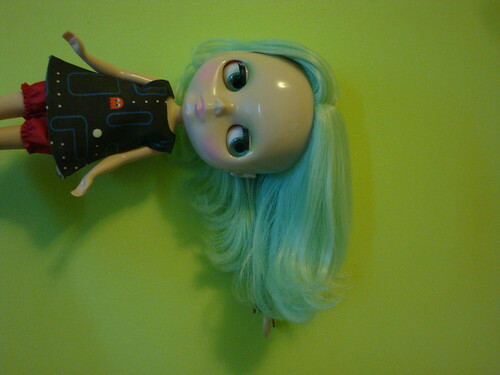 I am now hoping to get a variety of looks and haircolours and not end up with dollies that all look the same. I really like some of the fantasy hair ones (especially purple) but I almost always choose natural looking ones when I’m seriously contemplating buying. My sweet cousin pointed out that I had a lot of blondes in my family (I am a blonde, too) and I hadn’t even noticed…. So I have a self-ban also! No more natural colored hair colors or pink…. I am dreaming of a green haired beauty!